A Midnight Date. 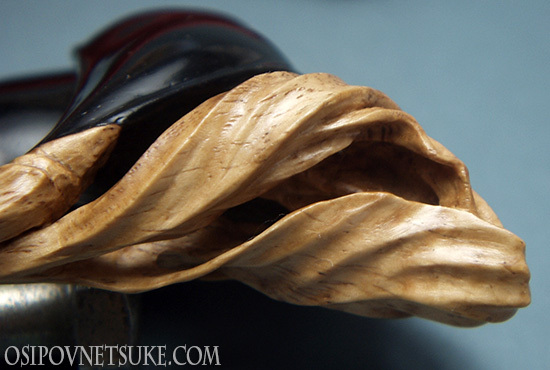 Netsuke by Sergey Osipov. Materials: African Blackwood. Amber and mother-of-pearl inlay. At first, I conceived the bean pods as a symbol of prosperity, health, and of autumn harvest. When the carving had almost been completed I saw that something was clearly missing... 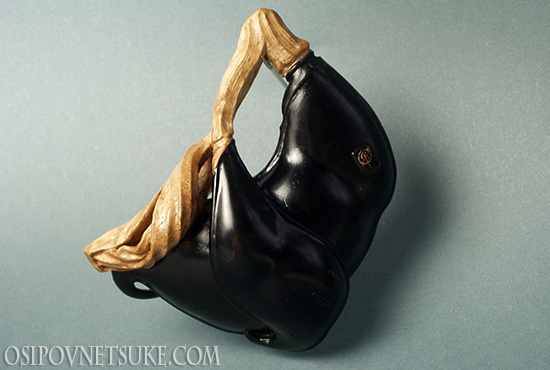 So for a long while the netsuke remained sitting on my shelf, waiting to be completed. I am very grateful to Anatol Ionis (Seattle, USA) for his original thoughts on the subject as they allowed me to find the "missing link". Of course, the bean pods are a symbol of autumn, completeness, ripe harvest, but missing was some symbol of beginning, of conception! So I added the crescent moon, young and growing, as a symbol of conception and development. Two pairs of eyes - his and hers - are meeting at midnight in their desire to start a new life, yet another symbol of something new and exciting. 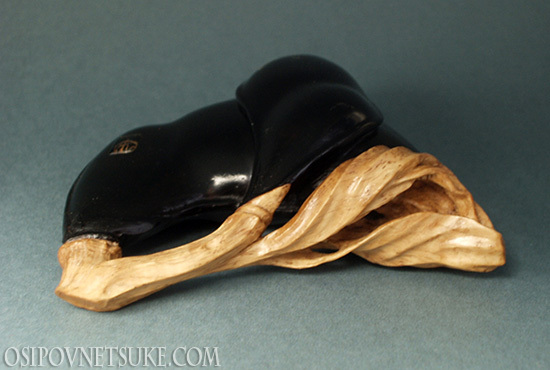 This netsuke is carved from a single piece of African Blackwood (Dalbergia melanoxylon), a gift from my friend and an amazing netsuke carver Janel Jacobson (USA). I used the lighter sapwood for the curled leaves and the dark core for the bean pods themselves. They are integral, made from one piece of wood, not glued together. 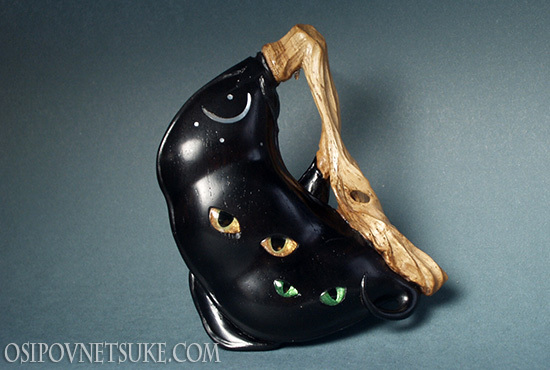 The crescent moon and the stars are inlaid with mother-of-pearl from the black-lip pearl oyster (Pinctada margaritifera). 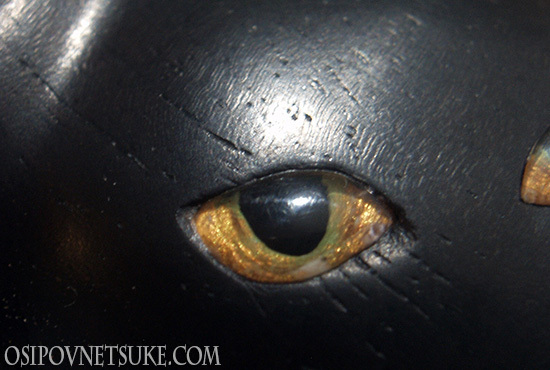 The eyes are inlaid with yellow amber. My signature is on the opposite side, engraved in an amber reserve.